This week, I voted against the new contract proposed by the City to settle its outstanding litigation with Orgaworld. This morning, I’d like to provide a little explanation for my vote, which was controversial. I believe we had an alternative, outlined below. The vote we took at Council on Wednesday was to approve a new contract negotiated between Orgaworld and the City. It settles all the outstanding litigation, which is good; legal fees on both sides have been mounting. The new contract reduces the amount of organic material that the City has promised to deliver to Orgaworld so that we’re not paying to compost material that we don’t deliver. And, it sets out a more flexible maximum amount that will now be calculated on a weekly rather than daily basis. That’s good news for taxpayers. We won’t pay for capacity we don’t use. The headline item was the proposal to pay Orgaworld an average of $0.15 per household per month to now accept plastic bags and dog waste. As I wrote in my newsletter last week, I struggled with whether to support that. It’s important to note that participation in the green bin program is very low. Only about half of people use it, which has profound implications for our city. By 2022, the Province wants to see all organics diverted from our landfill. When we get to the point where we have to replace our landfill, that will cost taxpayers in the hundreds of millions of dollars and will be a guaranteed site battle. No one wants a landfill in their backyard. Proponents see advantages to accepting dog waste and plastic bags in the green bin to forestall that day of reckoning. Dog waste will significantly boost the amount of waste we divert and will mean more of the material we deliver to Orgaworld is the right kind of organic feedstock. Less will have to be leaf and yard waste to make up our guaranteed delivery to the company. We’ll be able, over time, to compost more of that leaf and yard waste at much lower cost in our own open windrows at the Trail Road landfill. Further, proponents contend that allowing people to use plastic bags in their green bins will significantly boost participation. I tend to accept the intuitive understanding that many don’t participate in the green bin program because it can be gross without some education and work. I get it. While I’ve got some strategies at home to minimize odour and maggots, I don’t always succeed. It would certainly be easier to line my compost pail with a grocery store t-sack. No fuss, no muss. But we need to take a longer view. A word on mechanics: the process that will be used by Orgaworld to remove the plastic will see them use mechanical shredders and screens to sort out the plastic from the organics. Some “miniscule” amount of plastic will inevitably get into the final product (from there to be spread on farmers’ fields and presumably eventually wind up in our waterways), but the vast majority of it will be separated and landfilled. Proponents are right; that plastic would have been landfilled anyway. There is some discussion that we could store that plastic against the day when there is a market for recycling it, but I don’t accept that. Staff recently painted in a response to one of my inquiries a picture of stricter standards on recycled materials, the market for which is characterized by instability and oversupply. China has enacted a ban on importing four classes of recycled materials including plastics and unsorted paper. The trends aren’t encouraging that a market will emerge for plastic bags. We’ll have to pay more to ship them away, or landfill them, for the foreseeable future. It’s also important to note that Orgaworld will continue to struggle to create the best black gold – AA compost. As the backyard composters among us know, time is a friend to the biological processes of making good dirt. Today, Orgaworld’s process leaves the material to decompose for too short a time to make the good stuff. That’s important as we look at the alternative to the new contract: a restriction on the bags we can use to compostable-only bags. Orgaworld is making material that farmers love and is beneficial to the soil, but it’s not true compost. Proponents of this deal painted it as an all-or-nothing proposition. Councillors were either for the status quo (bad), or in favour of this deal (good). But there’s a middle ground. What would a progressive approach look like? Here’s my view. First, we’d restrict the type of bag that can be used to compostable bags. Specifically, those would have to conform to the ASTM standard D6400. There is a third party called BPI that tests bags against that ASTM standard, and certifies those with an easily-recognized logo. Where consumers choose to use those bags, Orgaworld’s mechanical processes would be made to recover any screened compostables (bags or other), and their compost would “bake” longer to ensure that it’s broken down into the best possible AA compost. We’d send as little to the landfill as possible, and ensure that any bag material that gets through is compostable and will eventually break down. It would also stop in its tracks creating a new perceived value for grocery store t-sacks in residents’ minds. But, we’d still have all the benefits of allowing bags into our stream, encouraging people to use the green bin and boost participation rates. That’s as far as we could have gone with this particular contract discussion. But we don’t have to stop there. In the next term of Council, we’ll be exploring the whole of our solid waste strategy – and it won’t be too late to enact a plastics ban without having to renegotiate this particular contract. Last summer and fall, I helped a group called Waste Watch Ottawa to produce and publish a report outlining how we can do better as a city – read it here. This post is already too long, and I’d encourage everyone to peruse that document for the kinds of measures I’d like to see on the table in that discussion. Wednesday’s vote isn’t the end of the discussion. Provincial and global trends are encouraging that producers will be required more and more to stop externalizing the environmental and economic cost of their products. My congratulations go to City staff for negotiating a contract that will be to the net benefit of taxpayers correcting some past missteps. The new contract doesn’t preclude us from making better choices in future. I am concerned that once we allow plastic bags in the green bins that it will be tough to reverse that. The new contract will allow the City to mount a significant new education campaign. 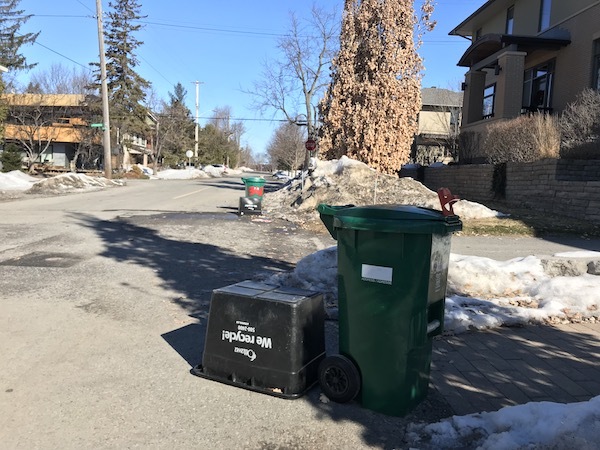 I and Councillors Nussbaum and McKenney, who also voted against this contract, will be urging the City to take advantage of that to balance encouraging use of the green bin with the drawbacks of using plastics. There are better ways of using the green bin. Just because we can now use plastics doesn't mean we should.